Recruiting by Wabash alumni is the heart of the College’s success in admissions, with more than 45% of prospective students being referred by Wabash grads. At Homecoming, the College honored two remarkable recruiters from two different generations. "You have raised recruiting to a virtual art form," National Association of Wabash Men Vice President Jim Davlin ’85 told Peter Pactor ’65 in naming him this year’s Wabash Admissions Fellow. "Right now seven Wabash students are here because you first told them about Wabash, then followed through with information and answers. For the Class of 2008, you referred 34 prospective students. Last year you referred 30 students; the year before, 13. "Sending names isn’t enough for you: you host recruiting events, you schedule students’ Indiana visits, and often accompany them to campus. We thank you for your dedication to the College, your ability to identify needs facing Wabash and the world, and your skill in bringing them together for the greater good of both." Pactor is young enough to have been recruited by Jim Price ’29, the pioneer in Wabash alumni student recruiting. Now 98 years old, Price has recruited more than 100 students, including current Dean of Students Tom Bambrey ’68, and still keeps on eye on the Bluffton, Indiana newspaper for prospects. 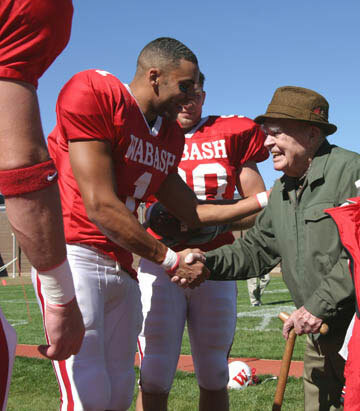 Price returned for Homecoming this year, prompting the Little Giants to honor him with a signed game ball (awarded by co-captains Brandon Clifton ’07 and Nick Williams ’05) and a moment of recognition before applauding Wabash fans—Bambrey and several other Price recruits among them—at the Homecoming football game.